I have often heard from fans who would like to get into the Angel and Buffy the Vampire Slayer comics but don’t know where to start. Because there are many editions and volumes out there, it can be confusing. Here is a quick guide to help you out. This guide provides some plot details without any major spoilers. My focus here on both the Angel and Buffy graphic novels is on the season arcs which followed the TV show. I’ve included the availability of Buffy library editions, which can be an economical way to build up your comics collection. This article has been updated in December 2018 to include the final additions to the Season 1-12 story arc. It’s always sad when a TV show that you love comes to an end. Although the TV finale was amazing, if only the Buffyverse story could continue in some way, fans could be even happier. The shows ended in 2003 and 2004 and there were rumours of spin-off shows featuring Buffy’s watcher Giles, or Faith the Vampire Slayer. Sadly, neither came about. The news that the story would continue in comic book form was both welcome and a little daunting for me. I was excited but not sure if the comic form could do the characters justice. 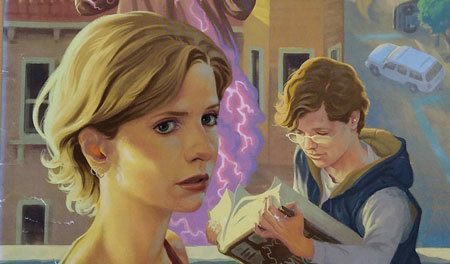 Though I had enjoyed some of the earlier Omnibus collections of Buffy comic books and Fray – a story of a future slayer which expanded the Buffyverse – I had not been an avid comic reader and it took me some time to get used to the style. I would definitely recommend reading Fray before starting on the following season collections. Find out more about Fray here. If the Buffyverse was only going to continue in comic book form, I was definitely going to have to commit more fully to the medium. I have not regretted that and as Seasons 8, 9, 10, 11 and recently 12 have hit the shelves I have read them avidly. The initial Buffy Season 8 story arc took incredibly long for the plot to unfold. It was told over 4 years between 2007 and 2011. By the time it got to the end I had forgotten how it started and had to re-read from the beginning! The storyline also didn’t seem quite consistent with the Angel comics that were being published separately. Things have improved hugely since then and the comics are now more accessible and faster paced. If you are new to the comics or are confused about the reading order, here is my guide. Look out for links below to availability of collections. Where possible I have linked to editions which are some of the most economical options to own the comic arcs, for example, volumes or library editions. Options also include used copies. See below for a super quick table guide of the reading order, followed by a more detailed breakdown. Vol. 1: Where the River Meets the Sea. Giles: Girl Blue Season 11 Dark Horse, 2018 Four episode mini series set within the timescale of Buffy the Vampire Slayer Season 11. Now available as a single graphic novel. Giles: Girl Blue graphic novel. 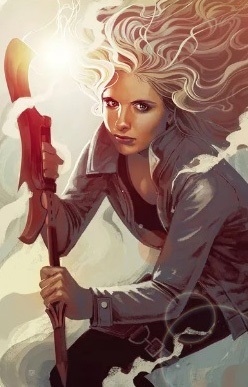 Buffy the Vampire Slayer Season 12 Dark Horse, 2018 Published as 4 issues which were released from June - September 2018. Now available as a single graphic novel. 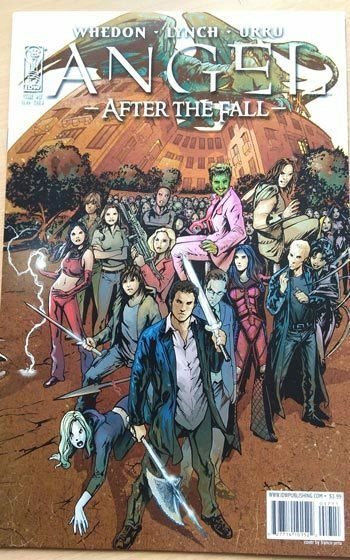 Buffy the Vampire Slayer Season 12 graphic novel..
Set before the events of the Buffy Season 8 comics; Angel: After the Fall was published by IDW from 2007. A 17 part series dealt with what happened to Angel and his friends directly after the final episode of the TV series, Not Fade Away. Angel had taken on the Senior Partners at Wolfram and Hart and as a result, LA was sent to hell. After the Fall was co-written by Joss Whedon and Brian Lynch. IDW continued to publish further Angel comics up to 2011, highlights included Drusilla focused episodes written by Juliet Landau. There is a detailed breakdown of the episodes and collections here. I am indebted to the Buffyverse Wiki for reminding me of the many complicated plot twists. There are many rewarding moments, but basically, good luck getting through this lot. Depending on how dedicated you are, you may want to skip these and go directly to Buffy Season 8. For those who are concerned with canon, only the 17 After the Fall episodes (contained in volumes 1-4) are definitely considered to be canon. However, a real highlight of IDW’s Angel run was the special short book, Lorne in memory of Andy Hallett. This brought closure to the story of the much-loved green empath demon played by Hallett. It was soooo exciting to get the first comic in Season 8 of Buffy. The story was continuing. The story was continuing! As perfect as the final episode of the TV show Chosen was, to get more Buffy in any form was something to sing about. Published by Dark Horse Comics, the story is set after Season 7’s finale and begins with Buffy leading squadrons of slayers in the ongoing fight against evil. One of the great things about Season 7’s Chosen was it hinted that Buffy would get to have a break now that lots of new slayers had been activated by Willow’s spell. But, unfortunately for her, she still had a lot of work to do. The season saw the slayers in tension with the military and the appearance of an ominous villain named Twilight. (Note: Nothing to do with the novels by Stephanie Meyer!) Enjoyable aspects of the comics included the return of several recurring characters from the TV show and new relationships for the lead characters. And oh, Dawn was a giant. Despite being complex and long-winded, as the first of the Buffy the Vampire Slayer graphic novels, Season 8 was an exciting ride, with episodes written by Joss Whedon and many other established Buffy writers including Jane Espenson, Steven S. Deknight and Drew Goddard. Library editions of Season 8 compile the whole season into four volumes, and are a good economic option to get hold of the season. Following Season 8’s finish and the end of Angel’s run with IDW, Angel and Buffy’s arcs were brought back together with Dark Horse producing both Buffy and Angel & Faith comics. This led to much more coherence. 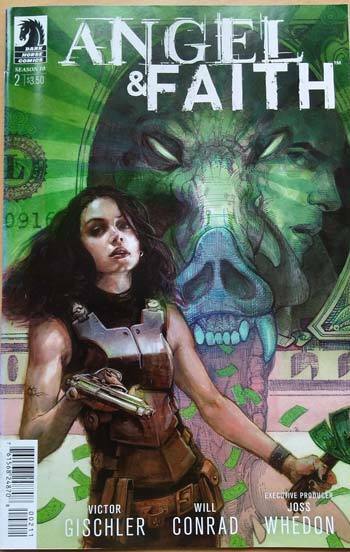 Both the Buffy and Angel and Faith comics now went under the heading of Season 9; their story arcs were connected and their events take place at the same time. The Angel and Faith comics worked well, building on the dynamics between the two characters at a difficult time for Angel. Angel and Faith were relocated to London. Readers in the UK may appreciate the realistic minor details relating to life here. The season saw the return of an old favourite character, Whistler who was last seen in Buffy season 2. Buffy Season 9 began with Buffy having relocated to San Francisco, living in a world without magic. She was seemingly dealing with a series of more down to earth crises than in the previous season. However, things were not as they seemed and the supernatural world soon came back into play in Buffy and her friends lives. Buffy Season 9 consisted of 25 issues which were later released as the following collections. The whole of Buffy Season 9 was also published as a 3 part library edition. Running alongside Buffy, the Angel and Faith Season 9, also contained 25 issues. It was published in the following collections and also in a 3 part library edition. Buffy Season 10 again ran alongside Angel and Faith Season 10. Buffy oversaw the return of magic to the world and shared the duty of establishing new rules for a changing supernatural world with old enemies. Angel was looking after an area and community of London which events of Season 9 had left forever changed by magic. Both series’ saw the return of familiar and much missed characters. A highlight of the series included Faith and Fred working under cover in a school. At the time of writing, there is no release date for library editions of Angel and Faith Season 10. From Season 11 there has simply been a Buffy title and an Angel title; Faith’s narrative having been separated from Angel’s. Buffy’s story gained a political edge, with the internment of all magical beings including Buffy, Spike and Willow. Buffy made a choice which was reminiscent of Season 3’s Helpless, leaving her physically vulnerable. Meanwhile Angel and Fred/Illyria were travelling through time and coming up against their former selves. Buffy and Angel Season Eleven contained twelve issues each and have been released as volume collections. Season 11 also contains a four episode mini series Giles “Girl Blue“, written by Joss Whedon and featuring the watcher going back to school. This is also available as a paperback volume. Buffy Season 12: The Reckoning was the final installment in the Buffy story arc which began with Season 1 of the TV show. This season was four episodes long and is now available as a graphic novel. With only four episodes, the season was a huge scaling back from the epic Season 8. Although the season was short it was sweet and brought about some resolution. It featured guest appearances from many of the runs characters including Faith, Fray, Ilyria and Angel. 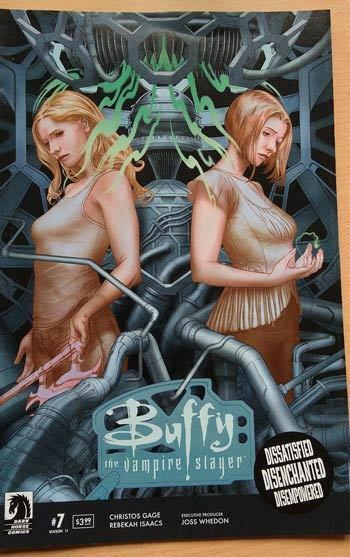 It was sad to find out that Season 12 was to be the last Buffy comic from Dark Horse. But it was soon revealed that the stories of the slayers’ were far from over. If you are not yet fully convinced; try watching the Buffy Season 8 Motion Comic DVD as an introduction to Buffy’s comic book narrative. Unfortunately it only goes as far as the first 19 episodes of Buffy Season 8 and no further Buffy Motion Comics were released. Click here for prices and availability of the motion comic. 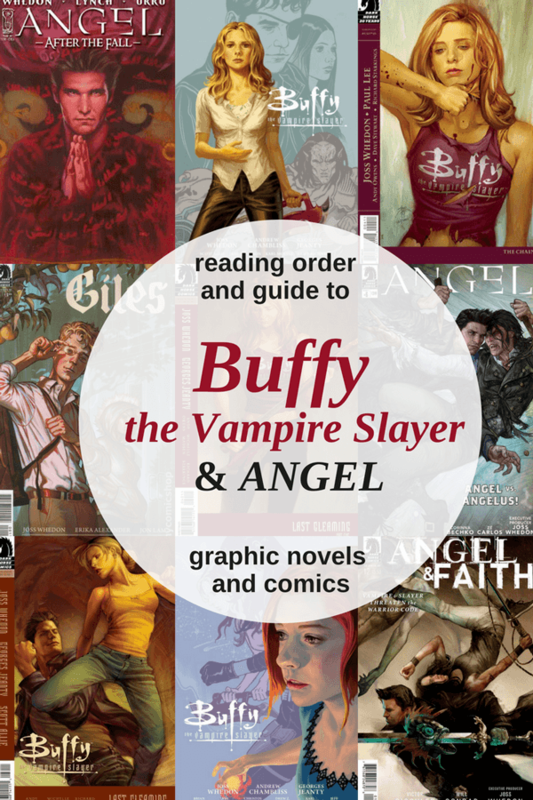 Let us know your thoughts on the Buffy and Angel comics in the comments below. If you are looking for more great reads for the grown-ups, check out our reviews and features here. And if you love graphic novels why not check out our Marvel books and gifts guide here.